The TERA publisher is happy the "distraction" is over but has been forced to lay off an undisclosed number of employees. NCsoft filed suit over TERA back in January, alleging that developer Bluehole Studio, comprised of former NCsoft employees who went off to do their own thing, "made off with copious amounts of confidential and proprietary NCsoft information, computer software, hardware and artwork relating to Lineage 3," which were then used in the creation of the MMO. That suit has now been settled and while the terms of the agreement are confidential, En Masse Corporate Development Director Yong Taek Bae said the company is "happy to have this distraction behind us." "We appreciate the support from all those who have believed in us. Our priority has been and always will be our fans and community," he said. "TERA will continue to thrive and provide a great player experience and value to existing and new gamers alike." Unfortunately, the news of the settlement was preceded almost immediately by an announcement of layoffs at the publisher. "Today, we had to let go of some of the great talent at En Masse Entertainment. While a tough decision, it was necessary as we prepare for the next chapter of our business," said Publishing VP Chris Lee. 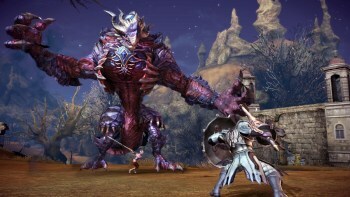 "TERA has been a great launch for us, and we are committed to our loyal players. We're taking measures to align the needs of our business to continue supporting TERA and preparing for our future. We are working with those affected by this transition, including offering assistance on new prospects within the industry/area." The publisher gave no indication of a connection between the lawsuit settlement, which may very well have cost the company a pile of money, and the layoffs, but it's not an unreasonable connection to make. Evan "Scapes" Berman, the former senior community manager at En Masse, certainly seemed to, linking to a report of the lawsuit settlement on Twitter "without comment."